A Fatah terror cell plotted to kill Egyptian President Abdul Fatah Sisi and then frame Hamas for the assassination, a senior Hamas official claimed. In a statement on May 16, Hamas representative Salah al-Bardawil said a Gazan terror cell formed by Tawfiq Tirawi, a senior Fatah official and the former head of the Palestinian Authority General Intelligence Services, planned to carry out the assassination plot. Bardawil said documents provided to him show the terrorist cell conspired to put the blame for Sisi’s assassination on Hamas in an effort to destroy Hamas’s relations with Egypt, which have recently grown warmer. 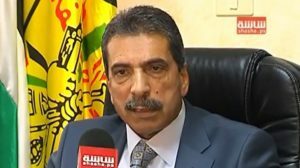 “We will convey these documents to Egypt and to other regional parties to show them the grave conspiracy created by Tirawi,” Bardawil said. In an interview with the Palestinian news agency Wafa, Fatah Spokesman Osama al-Qawasmi stated: “Bardawil’s allegations are lies that no Egyptian or Palestinian child believes in.